Looking for a utility to download website entirely or partially? 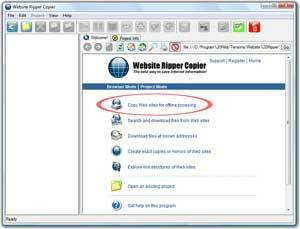 You should use the practical website download software - Website Ripper Copier. You are one simple step and a few clicks away to download website you wish. Just enter a website address and click Next, Next, and Run. Sitback and relax, this friendly website download software will download entire website for you quick. The friendly Project Wizard of this robust website ripper tool will guide you through the simple steps of creating your website download project in seconds, which you can tweak your project settings to download website exactly the way you want. 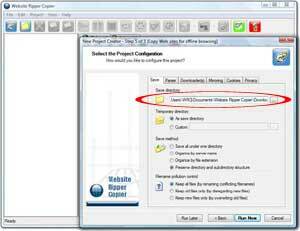 Select "Copy Web sites for offline browsing" option and New Project Creator Wizard will launch, please see above. 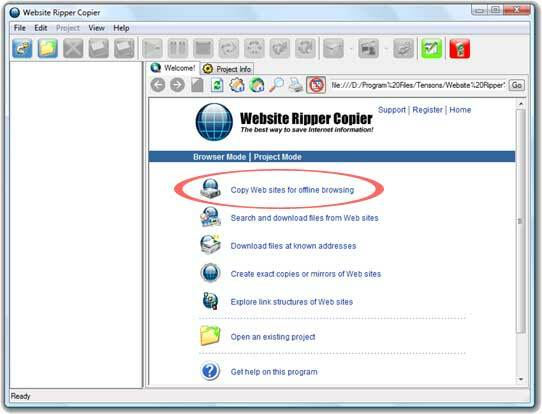 Website Ripper Copier can download password protected websites (Web authentication sites and form-based / cookie-based authorization sites). If the site prompts you for a password in order to access it, you may enter the web authentication info at Logins of Sites > Enter Login Manually > Web Authentication. For form-based / cookie-based authorization sites, please see the Help file (choose Help menu item on the Help main menu) of the program on the topic of "How to Copy Protected Web Sites." This robust website download application makes crawling protected sites easy. You may choose how deeply the program should explore from the starting page. 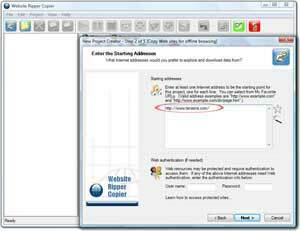 Whether you want to download website pages of another sites if the starting site links to them. By default, this value is "No". If you select "Yes", your project could run endlessly since other sites can link to other sites as well! 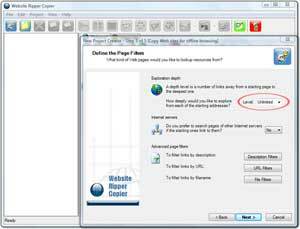 If you choose "Yes" option, you may use page filters to include or exclude web pages, to avoid a project runs forever. 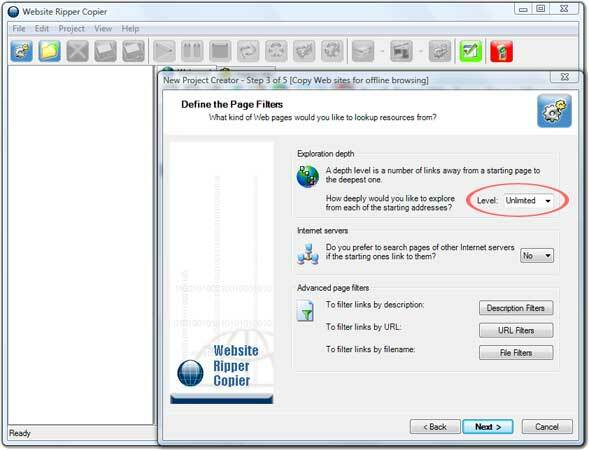 This website copier tool offers powerful, unique webpage filters (Internet resources filtration by link inner-text/description, URL, filename of URL) in order to download website pages you wish, or not to download site webpages you dislike. The "File types and sizes" section lets you to choose what types of files this save website software should download. By default, several file types are selected to download an entire website. If you want to download a complete website, you should select both HTML and Non-HTML file types. Again, this website downloader program offers powerful, unique file filters to download site files preferred, or not to download web site files unwanted. This is the last step of a project setup, where you can configure how your project should run. 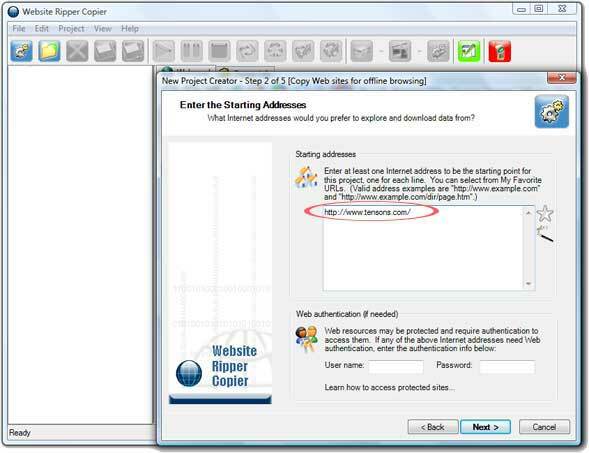 You may specify which folder on your computer this copy website application should download website data to. That's it! With a few simple steps, this website ripper software will download website you desired, and you can browse website offline using any web browser! 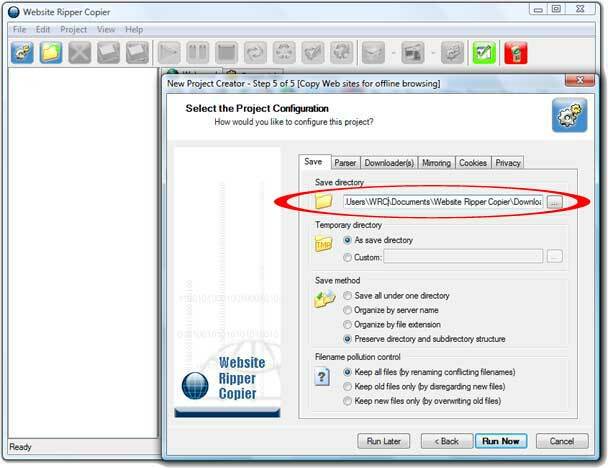 This website copier application automatically adjusts downloaded website links; thus, the downloaded website will work if you burn the downloaded site onto CD or DVD, or copy website downloaded to data storage devices, like USB stick, external disk etc. Copyright © 2019. Tensons Corporation. All rights reserved.